• 4 nights private accommodation in modern styled rooms with western bathroom/toilet and hot water shower. This can be booked any time if there is availability. Itinerary is a guideline only and will depend on weather and tide conditions. Nepal is served by Tribhuvan International Airport in Kathmandu. International flights fly directly from Bangkok to Kathmandu (Thai Airways), Singapore (Silk air), Malaysia (Airasia). Most flights in Europe transit in Doha, Dubai, Delhi. From the Kathmandu airport, we will pick you up and it is only 45 minutes to an hour’s drive to the retreat center. Visa-on-arrival is available at the Kathmandu airport. Please bring passport size photos for visa processing, or contact your local Nepal embassy to apply for visa before the trip. • Shirodhara- ayirveda technique for head treatment. Day 1: Arrival at Kathmandu International Airport, transfer by private transport to retreat center, evening yoga and meditation session, dinner and discussion, free time. 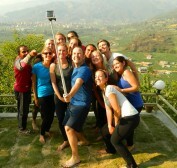 Day 2: Introduction to Jala-neti cleansing, morning yoga session. After breakfast, we take an easy 1.5-2hr hike up to the World UNESCO heritage site of Changu Narayan Temple and enjoy a well deserved lunch at local restaurant. From there we will walk back to the retreat center for evening yoga, pranayama and meditation and finish the day with a fresh organic dinner. Day 3: Visit Nagarkot sunrise by car, view tower for spectacular views of the sunrise over the Himalayan range. At 2,150m above sea level, enjoy breathtaking views of the major Himalayan peaks of Nepal like Manaslu, Ganesh, Langtang, etc, on a clear day one can even see Mount Everest (8,848m) from here. We will head back to the retreat for morning yoga, mediation and breakfast. By car, we head to Bhaktapur the ancient city, known as the City of Devotees, having more temples per square foot than any other place in Nepal. We will visit the Bhaktapur Durbar Square, Pottery square and other temples there are also various souvenir shops for some shopping. Visit Thanka art galleries and museums. After lunch at Bhaktapur we will head back to retreat centre for evening yoga and meditation session followed by dinner and discussion. Day 4: Morning meditation and yoga session followed by a healthy breakfast. By car we will head into Kathmandu to visit Patan which is one of 3 Royal cities in the Kathmandu Valley and a center of fine art and Buddhist and Hindu culture. From here we will head to one of the most sacred Hindu temples of Nepal – Pashupatinath Temple is located on both banks of Bagmati River on the eastern outskirts of Kathmandu.where Hinduists from every corner of Nepal and India are arriving here to die. By car we will have a lunch at Boudhanath Stupa which is the largest stupa in Nepal and the holiest Tibetan Buddhist temple outside Tibet. 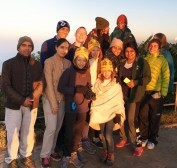 We we will then head back to retreat center for evening yoga and meditation session followed by dinner and discussion. Day 5: Morning meditation walk, morning yoga session. Enjoy healthy breakfast. Relax and be rejuvenated by the yoga and hiking activities from the past few days. Check out and transfer to airport.